Green and Gold Energy, Australia, keeps moving foreword on an impressive track to bring its products to the market. Twelve 1m2 SunBall™ Thermal Appliances units (shown) have been successfully built and are being used for tests and marketing. Four units are installed on the roof of Green and Gold Energy. Very high (35-38%) efficiency Spectrolab solar cells developed for the space industry. Deliveries to Australian customers will start in February and export orders in July. Their production schedule is for 100 units in February, 200 units in March, ramping up to 3,500 units per month in December 2006 and 5000 units per month by March 2007. They currently have about 1000 orders (letters) of intent, with 35% of the cost due to firm up the order and the remainder when the unit(s) are shipped. The Green and Gold SunBall™ technical brochure gives more details about the appliance. A RENergy article that summarizes the status of the companies activities can be found here. The concentrator idea has been done before - Midway Labs. My 'big concern' is the effect of the broadband radiation on the lifetime of the solar cell. Concentrated sunlight should mean a shorter cell life. I've not seen a lifetime projection. The cells used in the SunBall are very rugged, NASA has put them through exhaustive life testing, they are the ones used on the Mars rovers. There are other solar concentrators, but none are so well conceived, compact, sturdy, inexpensive, or easy to maintain as the SunBall. Which is all fine and good, but I've still not seen what the lifetime is going to be. Doped silicon will fail over time due to migration and phyiscal breakdown. Sunlight concentration should speed up that breakdown. So I'm not convinced (yet) when it comes to concentrators VS other cell technologies. 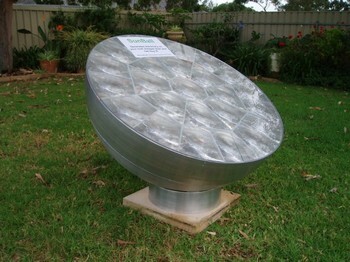 There are other solar concentrators, but none are so well conceived, compact, sturdy, inexpensive, or easy to maintain as the SunBall. Errr, that is 'marketing hype' more than actual fact. If you had Midway-made units, or any of the other kinds of concentrators that are/were in production, then compared 'em to the production sunball, then such a claim could be made. Right at the moment however 'none more compact' - the unit at Energy Innovations looks like it displaces less volume of space than the sunball. (Therefore, less problems under high wind) Well concieved? I thought Midway was a good plan - and it didn't work out. Inexpensive - Again, time will tell. Easy to maintain - Again, without comparisons - hard to say. I DO like the idea of a sunball on a roof as a 'light pipe' to bring in natural sunshine/heat. And I'd buy two less the PV parts for that purpose on a home I'm re-habbing. The Green and Gold has a website you can do some research with. Basicly they are saying they have a passive heat disappation system that actualy makes the Sunball cooler than tradition solarpanels. They are also doing some testing on the Sunball to see just how rugged it is. Right now they are projecting the life of the Sunball to be 25+ years. Nice article about how to design a building. As the technology is going high these days the structures are changing very fastly. Enginneres are trying to make every single inch usable for them. And same are for roofs also. As the concept of green use is on high. I found a very good website which has something about this http://www.bakerroofing.com check it once. I'm sure it will help you. Make sure you think about cyclone ratings if you want to put them on roofs. Cheap motorhome insurance can be more than just a dream with Quotezone. We can turn it into a reality and get your RV, VW or DIY campervan covered in no time. You can compare motorhome insurance more easily than ever before with our free service. There is just one form to fill in and once you’ve done that, we’ll take the strain on your behalf. Whether you have a Volkswagen, Mazda Bongo, campervan, caravanette or anything else, we could save you £££s on the motorhome insurance quote you need. i can just confirm to ensure that motorhome insurance. It's very reassuring to know that this information is adding value even to coaches who have successfully achieved 6 figures themselves! I'm so glad that this information continues to contribute to coaching businesses around the world weeks after it has ended!